Getting ourselves (and our luggage) from the bus to the train station through the crowded streets of Beijing was quite a task despite it only being a few blocks. Fortunately, we had our guide and the two people who accompanied her to help. Once we got to the station, we had to say farewell to our guides as only people with tickets are allowed in the station. We had to show our passports and tickets to get in. We made our way through the crowds in the terminal to the track where our train was waiting. It took us longer than normal to board the train because as we got on, we realized there was no room for our luggage in the cabins. 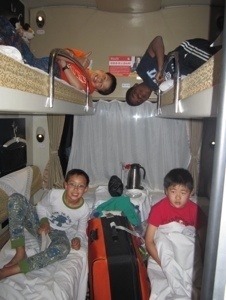 Apparently, these trains are designed for travelers on trips requiring less luggage, so we had to improvise with four people and their luggage in each cabin. It was impressive how well behaved and patient our children were during this whole process. they were quite the problem solvers and figured out how to utilize every inch of space. All of our cabins were right next to each other, so we were happy to settle in as a group. 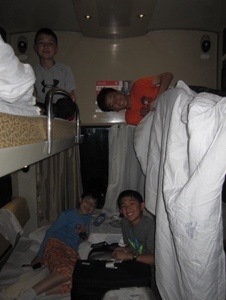 Our train ride was about 13 hours, and luckily, we were asleep for most of them. 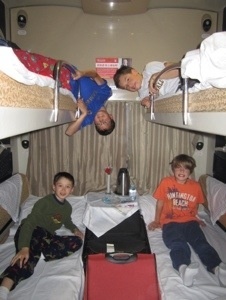 Shortly after leaving the station, the children got into their pjs and realized that brushing their teeth and using the bathroom while on a moving train would be a challenge. However, they remained positive despite the conditions. Some of the children were very studious, and they reviewed their notes from our days in Beijing in order to start their homework. We then all went to sleep very early. We arrived in Hangzhou a bit late around 9am, and we were met buy our guide in yet another crowded train station. Our week in Hangzhou had begun!